This is the first instalment of a two-part article on truck drag reduction. 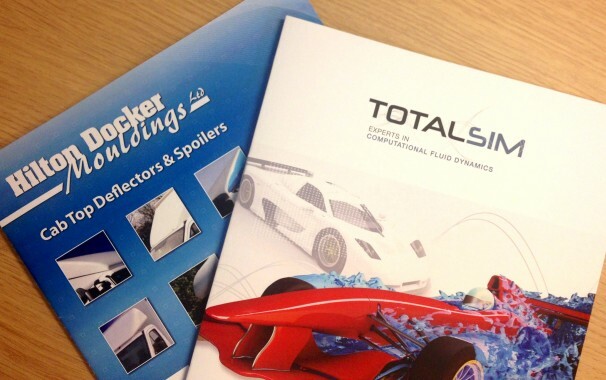 TotalSim recently attended the Multimodal Logistics show where we were exhibiting with Hilton Docker, who specialise in GRP mouldings and truck fairings. It became apparent at the show that there a huge desire to save drag and money within the industry. It also became apparent that there are a lot of poorly designed and fitted fairings. So TotalSim set themselves a challenge to see how much drag we could save on a common truck and trailer combination with the minimum of added features. The TotalSim process began with the scanning of a MAN truck and trailer (OK so it was only at model scale, but it will be good enough for the demonstration). TotalSim’s in house scanning team, set about scanning the truck and trailer before running it through our CFD (Computational Fluid Dynamics) software, to determine the amount of drag it was generating. Once this had been completed we then set about analysing the flow around the vehicle and targeting modifications to improve the aerodynamic performance. Their were two main features that were immediately apparent. There was a large separation from the leading edge of the trailer. There was a large separation from the A-Pillar and wing mirrors. These can be easily seen in the image below. The image shows an isosurface of total pressure. This shows low energy regions where the free stream energy has been removed. TotalSim then set about trying to design add-ons that would erase or reduce these highlighted regions of low energy air. TotalSim drew and tested two add-ons. A fairing to reduce the separation at the top, with sides to minimise any separation from the sides of the trailer. A novel A-Pillar turning vain to replace the wing mirror. The end result of these two ‘un-optimised’ components is a huge 28% drag saving. 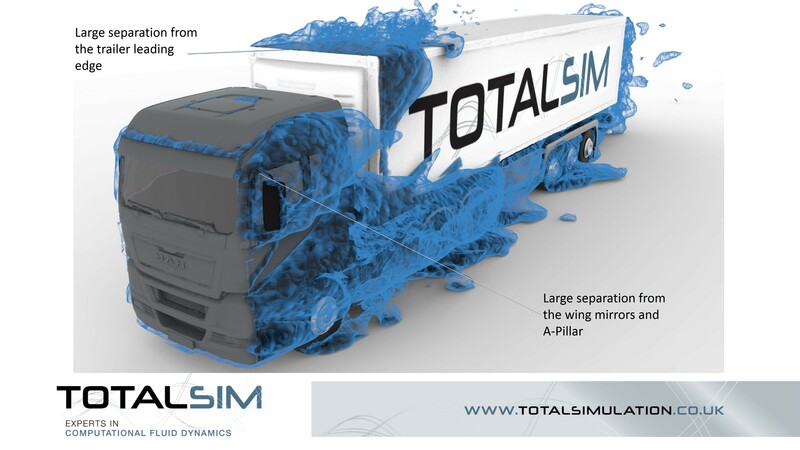 With TotalSim’s optimisation capabilities these products could be developed and optimised for a range of conditions and trailers. The industry is calling out for a revolution, to make huge step changes in the aerodynamic efficiency of vehicles. Whilst we wait for this to happen with minimial effort huge drag savings can still be achieved, as this brief exercise has shown. 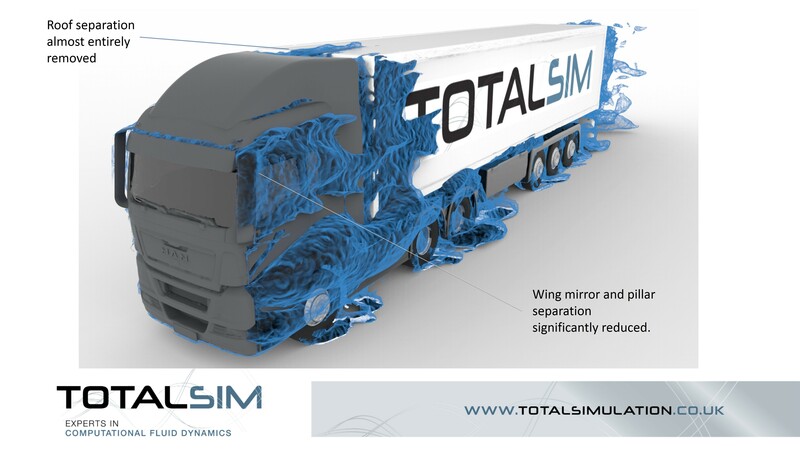 If you are interested to find out more about how TotalSim could help reduce the drag on your vehicles or fleet then please contact us. Working with Hilton Docker Mouldings, we now also have a partnership where our virtual optimisation can then be converted to the real world.